In order for us to get there without a rental car, we first took the metro to Garibaldi Station. I couldn’t help but laugh as the metro pulled up. It wasn’t sleek and new like in countless other cities in the world. Perhaps they are for other lines, but the one we hopped on was an ancient, slow Trenitalia train. Once we got to the main station, we bought tickets for the infamous Circumvesuviana line. A lot of travelers worry about catching the train at Napoli’s main train station and taking the CV because they are afraid of being pickpocketed. While this can and does happen, as long as you stay aware you shouldn’t have any problems. We didn’t. The station was quite busy with 95% tourists heading to Pompeii. Everybody was smoking. We happened to be standing beside two young British men and witnessed a funny encounter. An Italian man was going around with a small box of lighters trying to sell them to people, who would wave him along and that would be the end of it. He managed to engage these two guys and have a little bit of back and forth, neither of them really speaking the language. Eventually, after several minutes, the Italian was able to sweet talk them into buying a lighter with a kitten on it for one Euro. Twenty minutes later we got off at the Ercolano Scavi station and bought tickets for the ride up the mountain. Taking a private car or a taxi is an option, but we went with a company that takes small groups up in an eight-seat mini-bus. The narrow road twisted back and forth. I don’t know if I felt dizzy from the car ride or from excitement. I couldn’t believe Mount Vesuvius was so close, looming so huge right in front of me. I couldn’t believe the car I was in was driving up Mount Vesuvius! 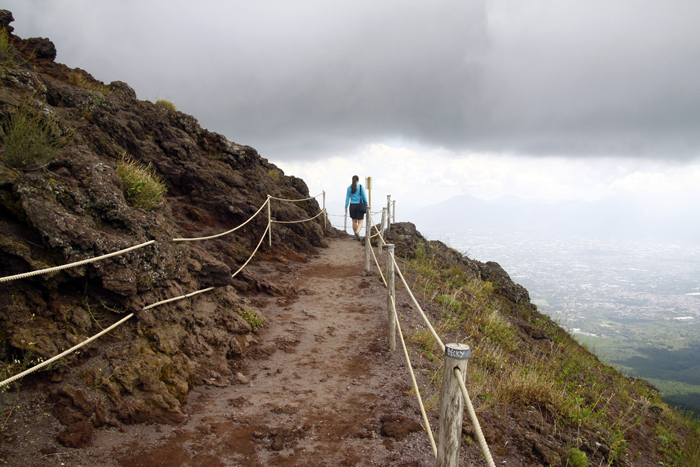 Another 15 minutes later and we were past the tree line and at the entrance to Vesuvio National Park. Although it was hot on the ground, the air was much chillier on the mountainside due to the change in altitude. If you plan to do this, even in the summer, make sure you bring a sweater and good walking shoes. Sandals will not do you any favours here as the path is covered in loose rocks. I read somewhere that the hike to the top is 15 minutes, but even though we are in good shape it still took us 30 minutes. We took it slow and stopped for pictures. It’s almost anti-climactic to climb a volcano, but once you get to the top and stare into the mouth of an active volcano, reality sets in. This is the only active volcano on mainland Europe, one that is overdue for an eruption and has three million people living beneath it. It was an incredible feeling to stare into that crater and it was very hard for me to peel myself away to meet our driver on time. 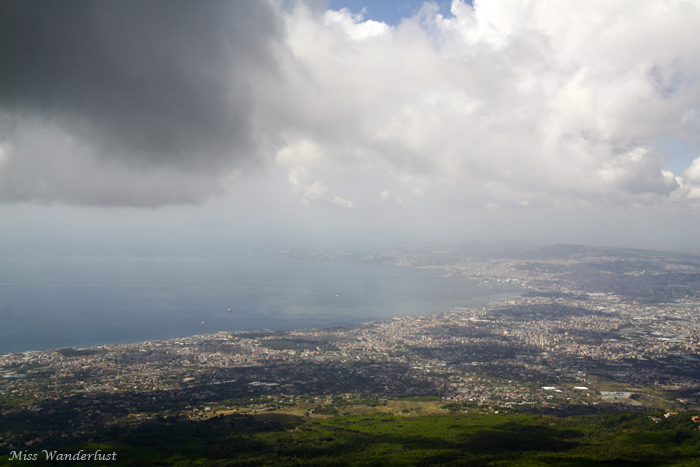 The view of Naples from high above and across the bay was stunning. It must be one of the most gorgeous views in the world. 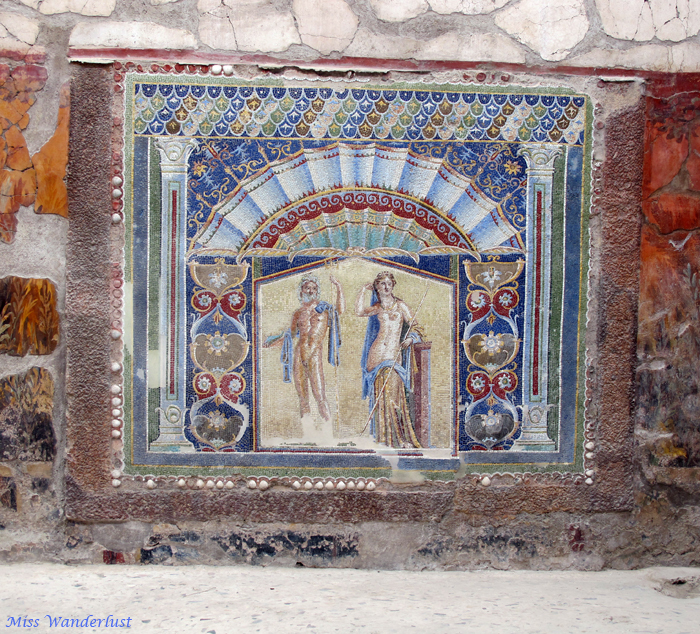 The town of Ercolano is named after the ancient city of the same name that was buried in the 79 A.D eruption. For hundreds of years in its more recent history the town was called Resina, but changed back to Ercolano (Herculaneum in English) in 1969 in honour of the ancient town. After our hike we stopped in modern Ercolano for lunch before walking a mere five minutes down the street to the ancient archaeological site, part of the UNESCO site that also includes Pompeii and Torre Annunziata. 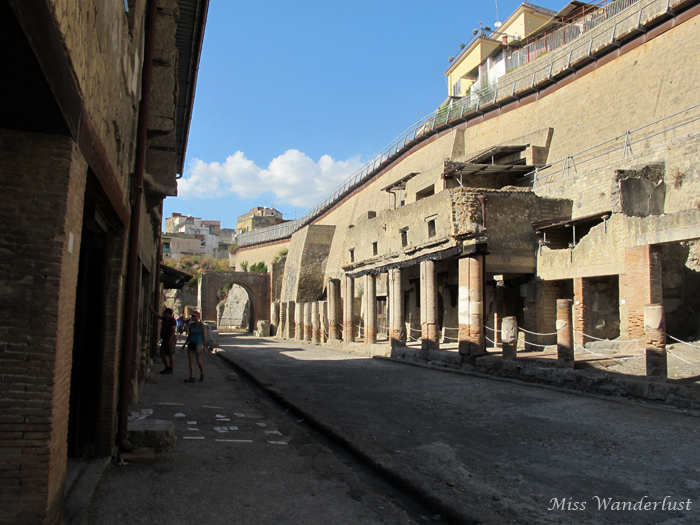 Herculaneum is much smaller than the more popular Pompeii, but the buildings and artifacts are even better preserved due to differences in the ash cover. Because of this, buildings are remarkably intact, and there are even wooden furnishings and objects that survived the eruption. It was very interesting to be able to walk through an almost complete town and into buildings with rooms with a roof and all four walls. It was a beautiful and sad experience. 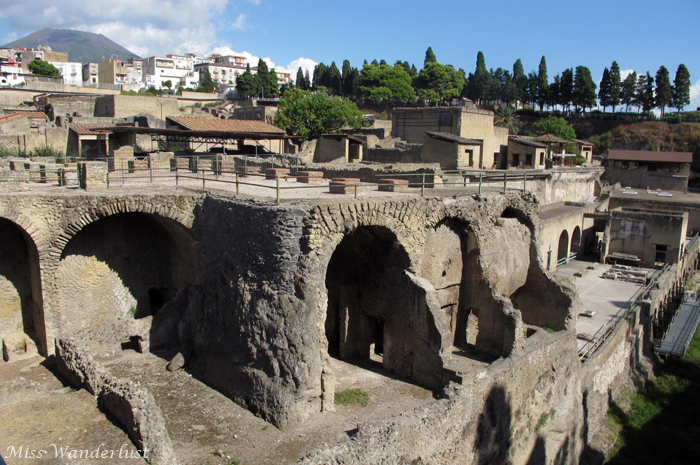 The amazing thing about Herculaneum is that only 25% of the site is uncovered, with the modern towns sitting atop untold treasures. I feel very fortunate to be able to visit archeological sites like this. Who knows if they’ll still be open to tourists in future generations, or what condition they will be in? 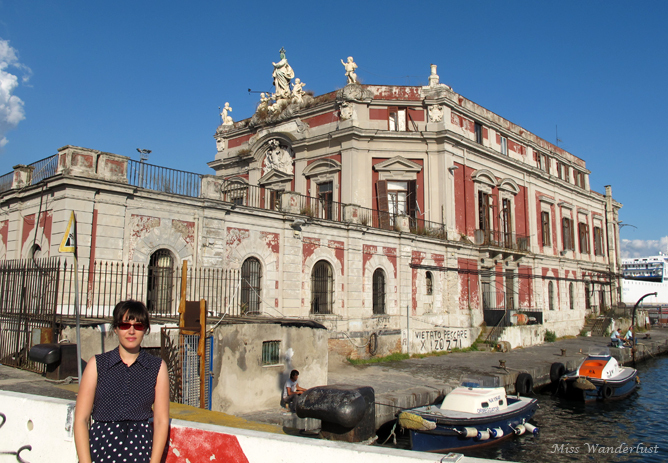 On our last full day in Naples we decided to get out of the historic centre and check out some other parts of the city. We walked over to one of the funiculars and rode up to Vomero Hill, where we drank in yet another fabulous view of Vesuvius and the historic centre. As we strolled we couldn’t help but notice how quiet the tree lined streets were. 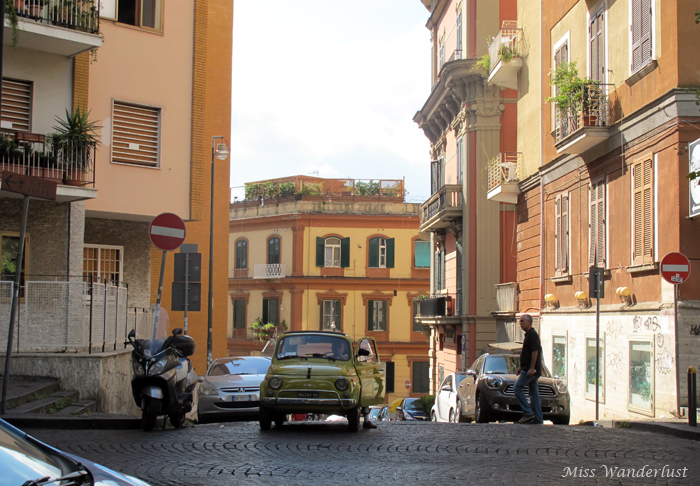 The atmosphere was much more calm and laid back than in the bustling centro storico. The buildings are gorgeous everywhere in the city, but there was a distinct lack o f graffiti in this part of town. Everything was pristine and orderly. If you showed someone a picture without saying where it was, nobody would ever guess it was Naples. 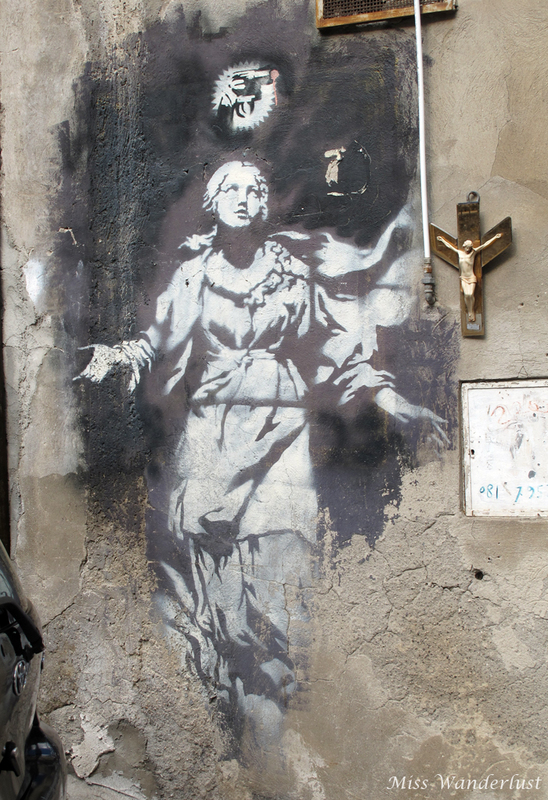 Once we got to Via Scarlatti, life erupted all around us. Suddenly, hundreds of people were everywhere, talking loudly with their mouths and hands. We popped into a few stores, but after a while the heat got to me and we started the long walk back to our B&B. I had such a terrible headache that I burst into tears and we had to flag down a cab to take us the rest of the way. I think this happened for a reason, though. I was gazing out the window at the city passing by, at all the streets we had not yet been down. I caught a flash of a building and I instantly recognized it, although we had not yet been there. 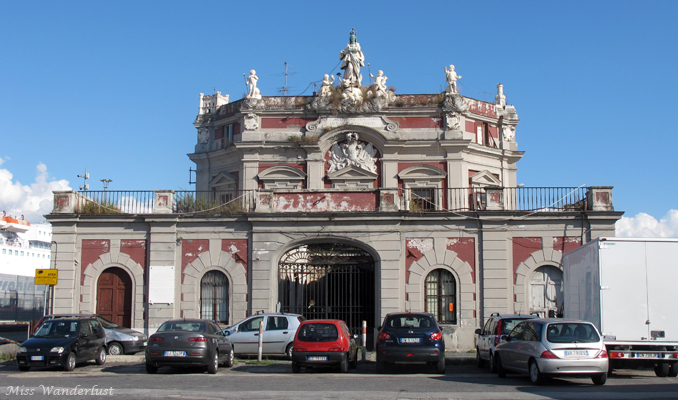 It was the Immacolatella building, an old customs station that thousands of Italian emigrants passed through on the way to their new homes. In 1956 and 1958, my family left Italy to make a better life for themselves in Canada. They were from a small village near Cosenza and got a ride to the big city, where they would board a ship to their new homeland. A huge part of the reason I wanted to visit Naples was to connect the dots of their journey, as I have already visited the tiny villages of Piane Crati and Donnici Superiore, as well as Pier 21 in Halifax where they first set foot on Canadian soil. Full blog post on that story coming soon. On our last morning we were having breakfast at our B&B and chatting with our hosts Marco and Simona. He asked about the origin of my last name and I told him my family was from Calabria. He then asked me my first name and I replied with “Karlie.” He paused for a moment with a slightly puzzled look, and a moment later his face lit up and he said “Ah, Carlina!” I found this to be really funny and cute because my Nonna always calls me Carlina, and whenever I get a card from her that is what’s written on the envelope. Apparently my name doesn’t exist in Italian! We boarded the Circumvesuviana again, this time destined for Sorrento, the tourist hot spot an hour south of Naples and the gateway to the Amalfi Coast, where we would be spending two days with Dave’s parents, aunt and uncle and family friends. We enjoyed Pompeii tremendously also. Very fun to revisit it through your eyes. Karlie, interesting story of your hike to Vesuvius. I wish we would have had the opportunity to see it right up close. Next time, that and Herculaneum. Great photos too! so well written i thought i was there. 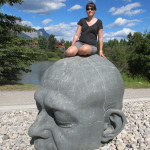 Another excellent blog post. Keep up the good work. Carlina, Thank you for sharing. This is what you were meant to do. 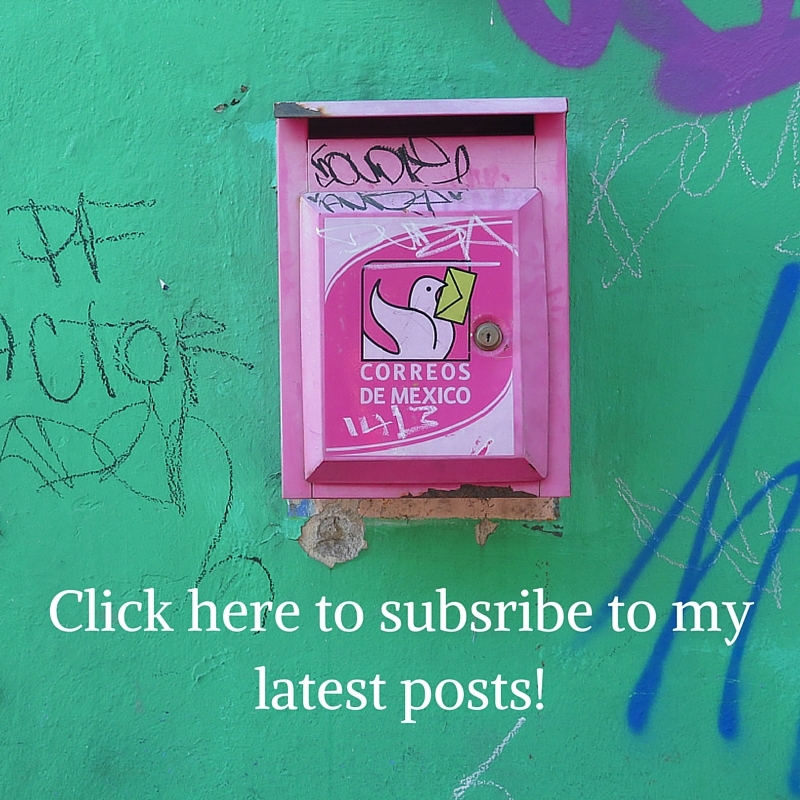 I am always so blown away with your blog. You found your niche. Fascinating blog, Karlie! Thanks for connecting with us on Twitter! Keep up the great work and travel safe! HI there! I am heading to italy in January and am hoping to do what you did! Similar to you I have grown up hearing all about mount vesuvius, and I was wondering if you could let me know the contact of that company that took you up from Ercolano Scavi station. Thanks Sarah! How exciting, you will be in awe. 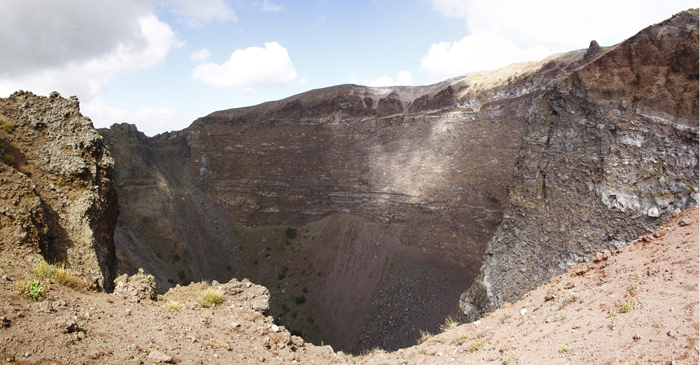 I believe the company we got a ride up the mountain with was Vesuvius Express: http://www.vesuvioexpress.info. When you walk out of the train station there will be mini buses lined up with guys outside waving you down, so you don’t have to worry about missing it 😉 They will point you in the direction of the ticket office, which is to the left of where you will exit the station. Let me know if you have any more questions! Thank you so much! I was actually disappointed when i read somewhere that they closed the area in january, and i found your blog shortly after 🙂 did you have to buy the tickets in advance?